I have a thing about drawing fish. I’m not afraid to admit it. It’s not my fault, it’s all Ian Miller‘s fault. When I was a kid I loved looking at the illustrations he’d done for comics and graphic novels, but it was his work in a book called The Guide To Fantasy Art Techniques that really got my attention. The book featured eight fantasy or science fiction artists and illustrators, showing some of their work and getting an insight into how they went about producing these amazing images. 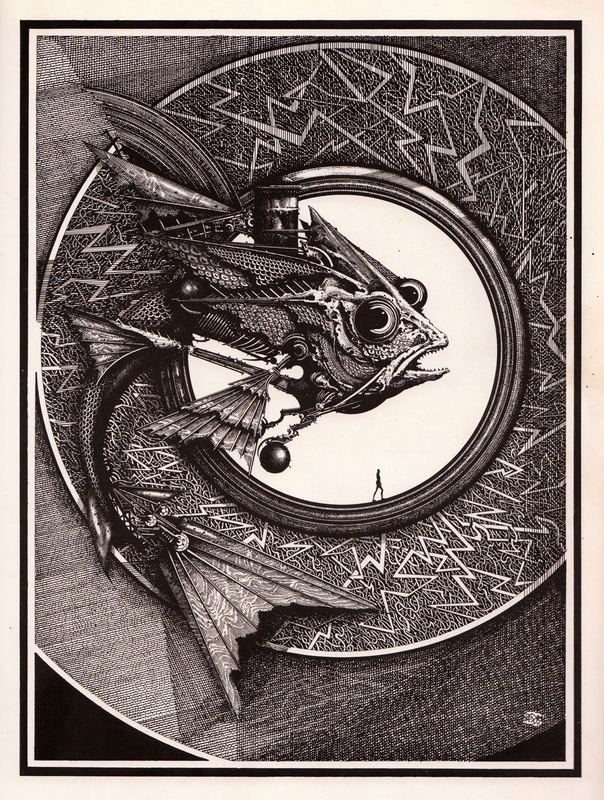 Delicacy of line and intricacy of detail typically characterise Ian Miller’s work, though his subject matter and technique often vary greatly. Equally at home with complex machinery or living creatures of various guises, his illustrations range from loose figure sketches in pencil and charcoal to pen and ink drawings of complex artefacts, twisted trees or winged insects. Armed with an expensive handful of Rotring pens I set about mimicking Ian Miller’s style. I drew insects, fish, even a self portrait for college in his super-detailed and nightmarish style. 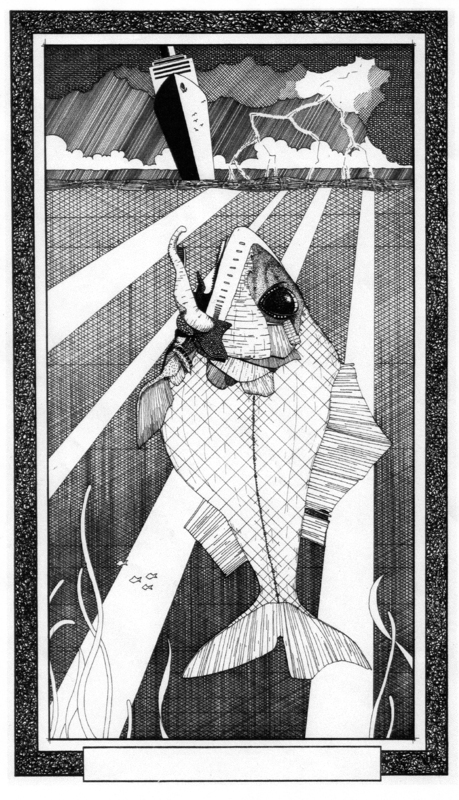 Eventually my work became more personal, but I was left with a love of drawing fish and deep-sea creatures. The picture here is from my time at art college in Cumbria. We were told by an illustration tutor that it wasn’t possible to produce a decent illustration using Rotring pens, and that real illustrators used dip or quill pens. Well, that was a challenge right there, so using nothing but a couple of those lovely burgundy Rapidographs I drew the Big Fish, Small Ship. Eighteen years later I’m still happy that it’s a decent bit of work. Although, for some reason I never wrote the title in the box I’d left for it. Big Fish, Small Ship. My response to a challenge by a college tutor. The fish! Tutor duly shamed. I should probably stop harping on about that tutor. Do you think his ears are burning?